Ben Kon is a trombonist, composer, keyboardist, and triple cello steel pan player from Central Florida. He holds a degree in music, with selected studies in Mathematics, from Stetson University. He has worked as a trombonist and musical director for Royal Caribbean International. His compositions have been performed in England, Haiti, and the USA, with some published by Wehr's Music House. 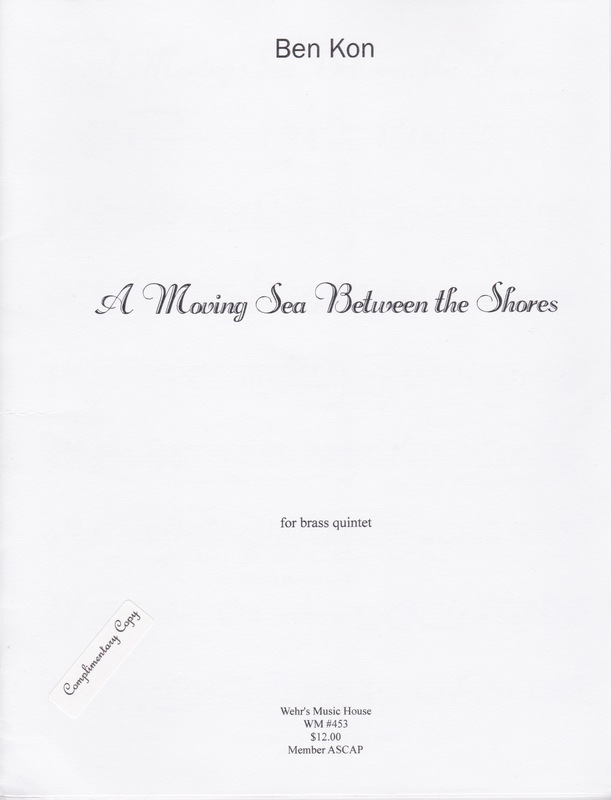 A Moving Sea Between the Shores was composed in 2010 for my sister, Elizabeth Holmes, and her husband Jonathan Holmes. The title is a reference to a passage from Kahlil Gibran’s The Prophet. The work consists of a slow, lyrical melody, set above a rising and falling ostinato in the lower voices, mimicking the steady undulation of ocean waves. A more lively dance-like section briefly interrupts this, before settling back down and quietly coming to a close. The writing is for the most part quite lyrical, with simple rhythms and conservative, tonal harmonies and melodies. It is playable by a student group; advanced ensembles could sight-read it without much difficulty.